Update: Trump has apparently taken notice, correctly pointing out that his approval rating, according to Rasmussen, is higher than Obama's was at this point in his presidency. Even Bloomberg and the Washington Post are being forced to admit that President Donald Trump's approval rating is on the rise. Both media organizations, which had seized on every opportunity to tout the president's approval rating when it was mired in the mid-to-low 30s, are now being forced to tout a recent Washington Post-ABC News poll showing Trump with an approval rating above 40% - his highest since his first 100 days in office. Furthermore, among men, Trump's approval rating has risen to 49%, while 47% of men disapprove. Meanwhile, 32% of women approve of the president's job performance. Meaning that, for the first time, half of US men support the president. Nearly every credible poll is now showing the president's job approval at his highest since taking office. On Friday, Rasmussen Reports published a poll showing 50% of likely US voters approve of Trump's job performance - while 49% disapprove. Of those 34% strongly approve of the president's jon performance, while 40% strongly disapprove. 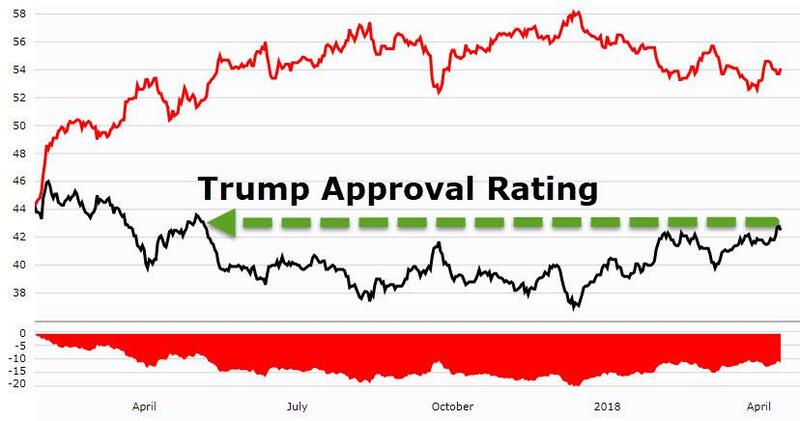 Last week, CNN was also forced to report that Trump's approval rating has rebounded to its highest level since the 100-day mark, with 42% of likely voters approving of the way Trump is handling the presidency. The president's strongest approval rating was for his handling of the economy, of which 48% approve and 45% disapprove. This is clearly a sign that the Republican's tax cut plan has been welcomed by most Americans, who are beginning to see more money left in their paychecks. Finally, an NBC News/Wall Street Journal poll released last week shows Trump's approval rating just four points below a peak reached last month - down from 43% to 39%. However, the president's decision to attack Syria will likely dent his support among some of his most fervent backers, who had applauded Trump's "America First" stance, and his promises to bring US troops home from abroad.